Deets: Catch-22 is a satirical dark comedy miniseries, based on the novel of the same name by Joseph Heller and adapted by Academy Award nominee Luke Davies and David Michôd. 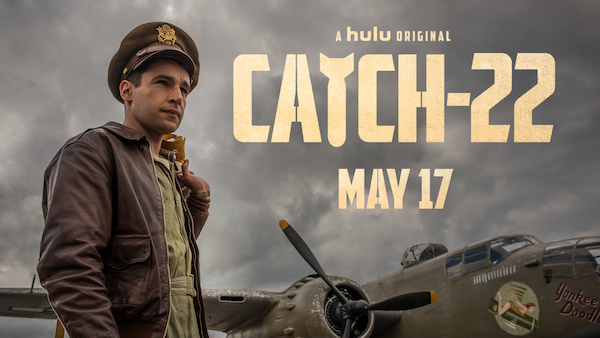 Catch-22 is described by Hulu as "the story of the incomparable, artful dodger, Yossarian, a US Army Air Forces bombardier in World War II who is furious because thousands of people he has never met are trying to kill him. But his real problem is not the enemy, but rather his own army which keeps increasing the number of missions the men must fly to complete their service. Yet if Yossarian makes any attempt to avoid his military assignments, he’ll be in violation of Catch-22, a hilariously sinister bureaucratic rule which specifies that a concern for one’s own safety in the face of dangers which are real and immediate is the process of a rational mind; a man is considered insane if he willingly continues to fly dangerous combat missions, but a request to be removed from duty is evidence of sanity and therefore makes him ineligible to be relieved from duty." Airs on Hulu starting May 17, 2019.